Nutritional markers, such as lean body mass (LBM) and serum albumin, predict outcome in dialysis patients, in whom protein-energy malnutrition is associated with increased morbidity and mortality. The metabolic effects of human growth hormone (hGH) may improve the nutritional and cardiovascular health of these patients and consequently reduce morbidity and mortality. The aim of this study was to establish clinical proof of concept of hGH treatment for the improvement of the nutritional status in adult patients who are on maintenance hemodialysis. A total of 139 adult patients who were on maintenance hemodialysis and had serum albumin levels ≤40 g/L were randomly assigned to 6 mo of treatment with placebo or 20, 35, or 50 μg/kg per d hGH. Change in LBM and serum albumin (primary outcomes), health-related quality of life, and secondary efficacy and safety parameters were monitored. The study showed that hGH treatment increased LBM significantly at all dosage levels (2.5 kg [95% confidence interval 1.8 to 3.1] versus −0.4 kg [95% confidence interval −1.4 to 0.6]; P < 0.001 for pooled hGH groups versus placebo). Serum albumin tended to increase (P = 0.076), serum transferrin (P = 0.001) and serum HDL (P < 0.038) increased, and plasma homocysteine was reduced (P = 0.029). TNF-α also tended to decrease with treatment (P = 0.134). An improvement in the Role Physical SF-36 quality-of-life subscale was observed (P = 0.042). There were no differences in clinically relevant adverse events between groups. In conclusion, hGH therapy safely improves LBM, other markers of mortality and morbidity, and health-related quality of life in adult patients who are on maintenance hemodialysis. A long-term study is warranted to investigate whether these treatment benefits result in reduced mortality and morbidity. Although several interventions are available for treatment of malnutrition in HD patients (e.g., dietary intervention, intradialytic parenteral nutrition, nandrolone treatment),6–13 they are often of limited efficacy and not without compliance problems and adverse effects. Malnutrition and a high mortality rate remain a challenge in the treatment of HD patients. In several small-scale studies, GH has been shown to reduce protein catabolism, increase muscle area and strength, and increase albumin levels, as well as improve HRQoL in HD patients.24–32 Because these biomarkers are strongly correlated to patients’ outcome, they point to a potentially beneficial effect of GH on mortality and morbidity in HD patients. These studies were performed on a small number of patients (≤11 patients in each treatment arm) and for short periods of time (maximum 6 mo), and only four were randomized, controlled studies.27,30–32 The objective of this study was to establish clinical proof of concept and optimal dosage of human GH (hGH) treatment for the improvement of nutritional status of adult patients in chronic HD. Screening comprised 230 patients, 91 of whom were screening failures, mainly because of median serum albumin levels outside the required range. A total of 139 patients were randomly assigned to the study from April 2003 to February 2005. There were 55 withdrawals, 37 as a result of adverse events (see Figure 1 for patient flow chart). Patient demographics at baseline are shown in Table 1. Patient flowchart. Adverse events that led to withdrawal, including eight events that led to death (†), included malaise/myalgia, pulmonary and peripheral edema, renal failure (†), subdural hematoma (†; n = 2), and headache in the placebo group; nausea, arthritis, pain in extremity, renal failure (n = 2), adenocarcinoma (†), myocardial infarction, and pneumonia (†) in the 20-μg/kg per d group; hypotension, cerebrovascular accident, bronchopneumonia (†), pain, sepsis, delirium, anorexia, peripheral edema, renal failure, pulmonary edema (†), cardiomegaly (†), and pain in extremity in the 35-μg/kg per d group; and anorexia, spinal ischemia, arthralgia, pulmonary edema, diarrhea, dyspnea, sepsis (†), congestive cardiac failure, chest pain, pain in extremity, bronchitis, and neuroendocrine carcinoma in the 50-μg/kg per d group. This study of 139 adult patients who were on maintenance HD was powered to detect significant differences in LBM between the treatment groups. The efficacy results are summarized in Table 2. 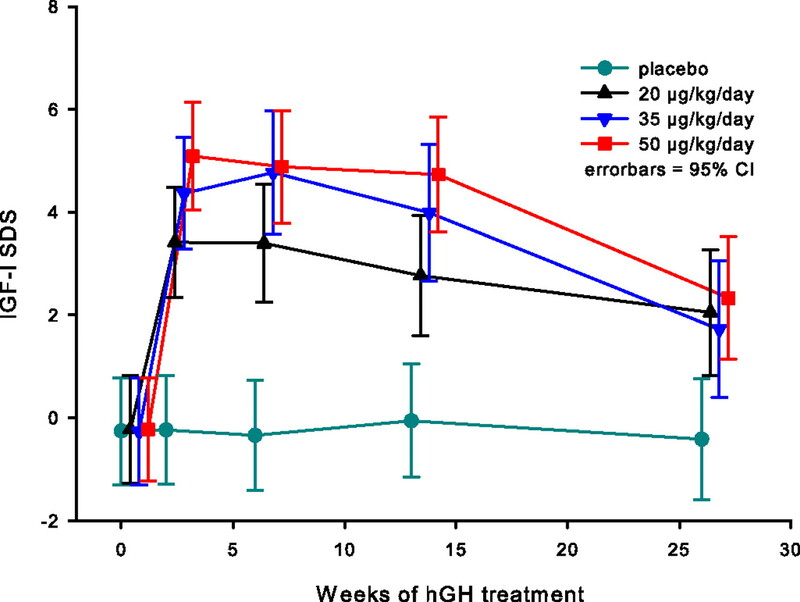 All dosages of hGH treatment resulted in significant increases in LBM compared with placebo (P < 0.001 for pooled and individual analyses), which were already apparent at week 13 (Figure 2A). Mean change in lean body mass (LBM; A) and serum albumin (B) from baseline to the end of the study for the four treatment groups is shown here with 95% confidence intervals. Changes in LBM were significantly greater for all three human growth hormone (hGH) treatment groups versus placebo (P < 0.001). An overall increase in serum albumin levels of 1.49 g/L that approached significance compared with placebo (P = 0.063) was observed in the 20-μg/kg per d treatment group. A drop in serum albumin levels was initially observed in all groups but was more pronounced with the two higher dosage hGH groups. This initial drop was followed by a steady increase in serum albumin levels in all hGH groups compared with a stable level in the placebo group. A positive trend toward improved serum albumin levels was observed in the lowest dosage hGH group versus placebo (P = 0.063; Figure 2B). The pooled treatment group analysis also showed a trend toward higher serum albumin levels in hGH-treated patients (P = 0.076). One reason that this trend did not reach statistical significance may be due to an initial decrease in serum albumin levels in all treatment groups but to a much larger extent in the two higher dosage hGH groups (data not shown). After this initial decrease, serum albumin levels increased steadily in the hGH groups while remaining stable in the placebo group. A small but significant correlation was seen between changes in LBM and serum albumin levels (R = 0.2; P = 0.005). At baseline, the normalized protein nitrogen appearance (nPNA) was 1.04 g/kg per d, slightly below the recommended levels of 1.1 to 1.2 g/kg per d for HD patients but similar to levels achieved in many clinical settings. There were no statistically significant or clinically relevant differences in the change in nPNA from baseline to end of treatment among the four treatment groups. Mean change in nPNA (g/kg per d) from baseline to end of treatment ranged from −0.06 (50-μg/kg per d group) to 0.07 (35-μg/kg per d group; Table 2). There were no statistically significant or clinically relevant differences in the change in HD time from baseline to end of treatment among the four treatment groups. No significant changes in HD time were observed (Table 2). Serum transferrin levels increased compared with placebo for both pooled and individual hGH treatment groups (P = 0.001; pooled), as did serum HDL cholesterol levels (P = 0.038; pooled). In the pooled analysis, treatment with hGH led to a decrease in plasma homocysteine compared with placebo (P = 0.029), and TNF-α also showed a NS decrease with treatment (P = 0.134). Patients who were on hGH treatment experienced a dosage-dependent reduction in mean body fat mass compared with placebo (P < 0.001; pooled and individual), and hip circumference also tended to decrease in the hGH treatment groups compared with placebo (P = 0.052; pooled). There was also a dosage-dependent trend toward an increase in speed for hGH-treated patients on the walking test (P = 0.371). A significant reduction in right-hand grip strength was observed in the 35-μg/kg group versus placebo (P = 0.040), but this was not apparent in the pooled analysis. There were no significant changes in the Visual Analogue Scale (VAS) appetite score among groups (data not shown). The Role Physical score of the Kidney Disease Quality of Life (KDQOL) instrument, measuring patient perception of how changes in physical health affect the ability to perform everyday tasks, was significantly improved for both individual and pooled hGH groups versus placebo (P = 0.042; pooled). Furthermore, in the pooled hGH analyses, there were NS trends toward improvement for the following SF-36 subscales compared with placebo: Emotional Wellbeing, Role Emotional, and Social Function. With regard to the kidney disease targeted subscales, hGH treatment was associated with clinically meaningful improvements in Burden of Kidney Disease and Patient Satisfaction. The safety results are summarized in Table 3, and adverse events that affected >10% of the patients are specified in Table 4. The mortality rate for this study was 11% for placebo compared with 8% for hGH-treated patients. The majority of adverse events were mild or moderate (527 of 596 adverse events) and unlikely to be related to study product (521 of 596 adverse events). There were no apparent treatment-dependent patterns in the frequency or types of adverse events reported. The rate of adverse events as a result of fluid retention was similar among treatment groups (two events in each group except for the 20-μg/kg per d group, which had no events), and these events tended to be transient, with none leading to withdrawal. Five serious adverse events were potentially related to cardiac congestion: Exacerbated dyspnea and respiratory failure in the placebo group, pulmonary congestion in the 35-μg/kg per d group, and dyspnea and congestive heart failure in the 50-μg/kg per d group. All of these events, except for the respiratory failure in the placebo group and the dyspnea in the highest dosage group, recovered by study end, most without changes to trial drug treatment. hGH treatment was not associated with any serious safety concerns in glucose metabolism, and the treatment did not affect left ventricular mass size. Adverse events that were considered possibly/probably related to treatment by the investigator increased with dosage of GH treatment (8, 11, 23, and 33 such events were reported in the placebo and 20-, 35-, and 50-μg/kg per d groups, respectively). The majority of adverse events that were considered to be of probable/possible relation to the trial product by an investigator were within the following categories: Musculoskeletal and connective tissue disorders, general disorders and administration site conditions, metabolism and nutrition disorders, and nervous system disorders. Thirty-seven patients were withdrawn from treatment because of an adverse event (see Figure 1 for further details). IGF-I and IGF-binding protein-3 (IGFBP-3) levels increased initially and then decreased during the study, particularly in the two higher dosage hGH groups (Figure 2). Changes in LBM, serum transferrin, and plasma homocysteine, all of which are markers for mortality and morbidity in these patients, were of a clinically relevant magnitude, particularly for ESRD patients, and indicate the potential for improved long-term outcome in response to hGH treatment in these patients. The beneficial effect of hGH treatment on homocysteine should be carefully considered because the epidemiology of homocysteine may be reversed in HD patients, whereby low levels of homocysteine indicate poor cardiovascular outcomes rather than the protective effect that is seen in healthy individuals.35 This may reflect the impact of malnutrition on circulating homocysteine levels. However, in this study, homocysteine levels were reduced from high to normal but not to low levels, supporting an overall beneficial effect of hGH on cardiovascular biomarkers. 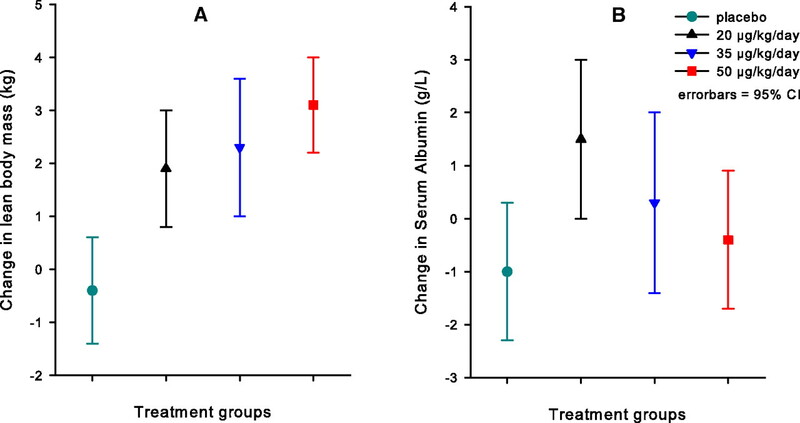 A positive trend toward increasing levels of serum albumin was observed for the lowest GH dosage (20 μg/kg per d; P = 0.06), whereas the effect was less pronounced in the higher dosage groups. Initially, a decrease in serum albumin levels occurred in all dosage groups but to a greater extent in the two higher dosage GH groups. A similar initial decrease in serum albumin levels after short-term GH treatment of peritoneal dialysis patients related to fluid retention, a change in amino acid metabolism, or a direct effect of treatment on serum albumin synthesis has been reported.25 In this study, the initial decrease in serum albumin did not seem to be due to GH-related fluid changes (exploratory post hoc analyses did not indicate that difference between weight at dialysis and at dual-energy x-ray absorptiometry [DXA] scan for each visit was likely to be a contributing factor to the increases in LBM that were observed in hGH-treated versus placebo-treated patients [analysis of covariance (ANCOVA) model adding weight gain per visit and weight gain per treatment as additional covariates; data not shown]). Furthermore, only six events of fluid retention were recorded during treatment, including two events in the placebo group. The effect of hGH treatment was not statistically significant for the apparent dosage-depended initial decrease in serum albumin levels between baseline and week 2 (ANCOVA model adding Kt/V per treatment and time in dialysis at baseline per treatment as additional covariates; data not shown). Albumin has for many years been an established marker of nutritional status36 and is recognized by the National Kidney Foundation as important and clinically useful in the nutritional assessment of dialysis patients.37 Despite its value and wide use in this nutritional assessment, it should be noted that albumin levels are also influenced by factors such as gender,38 age,39 and, in particular, inflammation.40–42 It has been indicated that albumin levels remain virtually unchanged under conditions of severe protein-energy malnutrition in otherwise healthy individuals until near terminal starvation.43 In addition, to be used as a nutritional marker, albumin is well established as a strong predictor of outcome in dialysis patients.44,45 Furthermore, Rocco et al.46 recently showed that failure to meet the treatment goal recommended by the National Kidney Foundation of albumin levels >40 g/L is associated with poor outcome. A recent report on a retrospective evaluation of 58,058 maintenance HD patients showed that an increase of >1 g/L in serum albumin over 6 mo predicted improved survival in the subsequent 18 mo, independent of baseline serum albumin values,47 supporting the notion that dynamic changes in albumin levels may be predictive for patient outcome. In addition to nutritional markers, markers of inflammation have been closely linked to mortality and morbidity in HD patients.34 In other patient groups, GH has been shown to modify inflammation, decreasing variables such as C-reactive protein (CRP), IL-6, and TNF-α. In HD patients, GH has also been shown to improve polymorphonuclear leukocyte function.48 In this study, a NS decrease in TNF-α was seen (Table 2), whereas no treatment effect was indicated on CRP, IL-6, and LBM (data not shown). Treating HD patients with hGH was safe. In particular, no patients developed diabetes or increased left ventricular mass. There were no differences in adverse events or serious adverse events among treatment groups; however, there was a tendency toward an increased number of possibly/probably related adverse events with increasing hGH dosage (namely arthralgia and hyperglycemia). Within the first weeks of treatment, IGF-I increased rapidly and dosage dependently to 3 to 5 SD score (SDS). After this initial increase, IGF-I levels decreased in the active treatment groups to approximately 2 SDS, whereas IGF-I levels remained at a stable level of approximately 0 SDS in the placebo group. This pattern may be explained by a physiologic adaptation to supraphysiologic hGH dosages (Figure 3). In active treatment groups, IGF-I levels increased rapidly and dosage dependently to 3 to 5 SD score as shown here with 95% confidence intervals (CI). After this initial increase, IGF-I levels decreased to approximately 2 SDS. In the placebo group, IGF-I remained at a stable level of approximately 0 SDS throughout the trial. Body fat mass may be protective in HD patients because low fat mass and loss of fat mass are associated with increased mortality50; however this reverse epidemiology observation is not universally accepted and may merely reflect the malnutrition of those with reduced fat stores.51 In this study, there was a dosage-dependent decrease in fat mass with hGH treatment. There was no significant change in nPNA from baseline to end of trial in any of the treatment groups, suggesting no significant impact of hGH treatment on dietary protein intake. Treatment with hGH is likely to have increased protein anabolism, as reflected by the observed increase in LBM. It is a limitation of the study that not enough patients were enrolled to allow for an evaluation of significant differences in serum albumin levels among treatment groups. Another limitation is that protein intake was measured only indirectly by the VAS for appetite, for which no differences among treatment groups were found. Therapy with hGH safely improved LBM, other cardiovascular risk factors, and HRQoL in adult patients who were on maintenance HD. A longer term study is warranted to investigate whether these treatment benefits lead to reduced mortality and morbidity in this patient population. This was a 6-mo, double-blind, parallel-group, placebo-controlled, multinational study conducted at 23 centers in nine countries (Czech Republic, Denmark, France, Hong Kong, Israel, Poland, Singapore, Sweden, and the United Kingdom [see Appendix for investigators and centers]) in accordance with the Declaration of Helsinki and International Conference on Harmonization/Good Clinical Practice guidelines for clinical investigations.52,53 Written informed consent toward trial procedures and publication of data were obtained for participating patients before any study-related activity. The study population included nondiabetic patients who were ≥18 yr; at baseline had a median of three serum albumin levels ≤40 g/L; and had been receiving stable, adequate HD treatment for 3 mo (Kt/V >1.2 and/or HD performed 4 h, three times weekly). Patients with active malignant disease, diabetes, GH deficiency, or other critical illnesses were excluded from the study. Originally, 240 patients were planned for randomization (based on power calculation for serum albumin), but because of recruitment difficulties, the power calculation was restricted to LBM; consequently, the planned number of randomly assigned patients was diminished to 92 patients (assuming a dropout rate of 30%). A computer-generated randomization scheme (lowest available number) was used to assign patients to one of four treatment groups: Daily subcutaneous injections of hGH (Norditropin SimpleX, Novo Nordisk A/S, Bagsvaerd, Denmark) 20, 35, or 50 μg/kg per d or placebo. The dosing regimen required that three of seven weekly injections be given in connection to dialysis (postdialysis) and the remaining four injections be given at bedtime. Both patients and investigators were blinded to group assignment. Randomization codes were concealed until end of trial or patients were withdrawn. The randomization list and all study products were provided by Novo Nordisk A/S. The primary outcome measures were change from baseline to end of study in LBM and serum albumin levels. The study was powered to evaluate statistically significant changes in LBM only. The secondary efficacy end points for this study included changes in body fat mass by DXA; serum-transferrin; plasma homocysteine; HDL cholesterol; serum markers of inflammation (CRP, IL-6, TNF-α, and mannan binding lectin); HRQoL assessed by the validated KDQOL v1.2 instrument consisting of the SF-36 questionnaire and a range of kidney disease subscales; and evaluations of hip circumference, hand grip strength by the JAMAR hand dynamometer, a 30-m maximal speed-walking test, and appetite evaluated by the eight-level VAS.54 The safety end points comprised adverse events, left ventricular mass measured by central evaluation of echocardiographic recordings, IGF-I/IGFBP-3 molar ratio, IGF-I and IGFBP-3 SDS, fasting blood glucose and insulin, glycosylated hemoglobin, and mortality. Changes in body composition (LBM and fat mass) were primarily evaluated by DXA scanners. For controlling for potential variability, all DXA scans were standardized and reanalyzed by certified technicians to correct for interscanner variability. A whole-body phantom was used to document instrument cross-calibration and evaluate the long-term stability of the scanners that were used in this study. In addition, the analysis of longitudinal quality control data for each scanner allowed for the quantification of scanner drifts and confirmation of the general stability of each scanner in the study. nPNA, a reflection of protein intake, was calculated by the two–blood urea nitrogen, single-pool, variable-volume model (NKF K/DOQI guidelines 200037) as were the urea distribution volume, using Watson's formula. Serum albumin and serum transferrin were analyzed using the Nephelometric BN ProSpec Dade-Behring assay (inter- and intra-assay coefficients of variation were <3% (Deerfield, IL). A batch-wise analysis of frozen stored samples of serum albumin was performed at a central, certified laboratory to minimize interbatch variation, as well as the general drift of the assay used over time. Serum albumin values were derived from a median of three measurements. An ELISA immunoassay (Photometer Tecan SLT Spectra III, Tecan US, Research Triangle Park, NC) was used to measure IGF-I, IGFBP-3, and TNF-α; a fluorescence polarization immunoassay (Axsym, Abbott, Abbott Park, IL) was used for plasma homocysteine; and an enzymatic colorimetric test (Olympus AU640, Center Valley, PA) was used for HDL cholesterol. L and H are the lower and higher reference range values provided by the laboratory (IGF-I 93 to 410 ng/ml for men and 91 to 443 ng/ml for women; IGFBP-3 1500 to 4600 ng/ml for men and 2670 to 5580 ng/ml for women). A sample size of 16 patients in each treatment arm were needed to have a statistical power of 90% to detect an increase in LBM of 3, 2.5, 2, and 1 kg in the 50-, 35-, and 20-μg/kg and placebo groups, respectively. All statistical analyses were performed using SAS statistical package (v8.02; SAS Institute, Cary, NC). Descriptive statistical results are presented as means ± SD, median, and confidence interval and as a percentage of all patients as appropriate. An ANCOVA was applied to changes from baseline to end of treatment taking treatment arm and baseline level into account. The overall test for effect was performed as a two-sided F test with 5% significance. 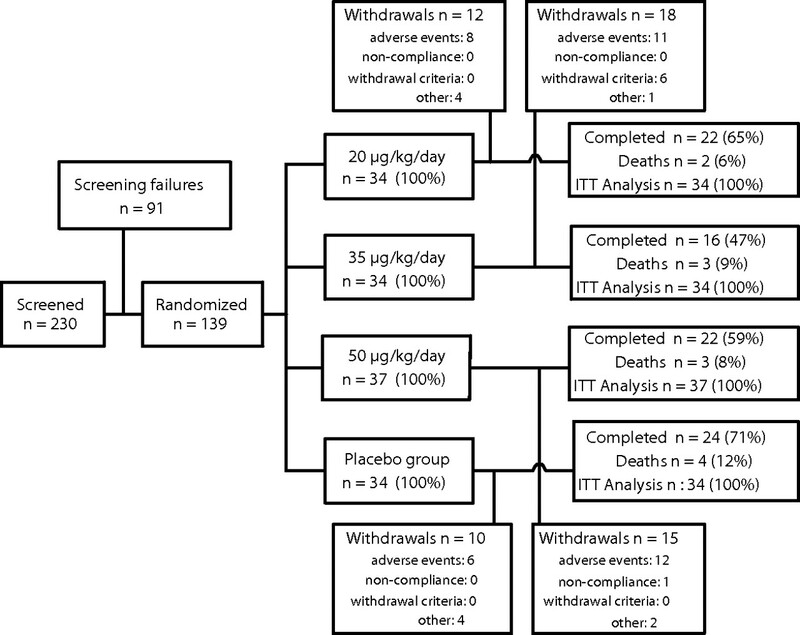 All four treatment groups were compared in the baseline-adjusted ANCOVA, and pair-wise t tests were performed using the Tukey method to adjust for multiple comparisons, and, if no significant differences were found among the three hGH-treated groups in the pair-wise tests, then they were pooled and tested versus placebo in a baseline-adjusted ANCOVA. Adverse events were evaluated with a Cochran-Mantel-Haenszel χ2 test for the proportion of patients with the event to test for treatment difference. The intention-to-treat analysis set included all patients who were treated with at least one dose of trial product. All presented analyses are based on the intention-to-treat analysis set, and the results are presented as change with 95% confidence intervals (Tables 2 and 3). In general, model assumptions were checked descriptively using box plots and normal quantile-quantile plots. The Adult Patients in Chronic Dialysis Study (APCD) Group is represented here by principal investigators for each study site by country: Czech Republic: Prof. S. Sulkova, General University Hospital, Prague; Denmark: Prof. B. Feldt-Rasmussen, Copenhagen University Hospital, Copenhagen, Dr. M. Madsen (deceased), Skejby Sygehus, Aarhus; France: Prof. T. Hannedouche, Strasbourg Hospital, Strasbourg; Hong Kong: Prof. K.N. Lai, Queen Mary Hospital, Hong Kong; Israel: Prof. E. Holtzman, Chaim Sheba Medical Center, Tel Hashomer, Prof. U. Gafter, Rabin Medical Center, Petach Tikvah, Dr. D. Schwartz, Sourasky Medical Center, Tel-Aviv, Dr. Z. Katzir, Wolfson Medical Center, Holon, Dr. J. Weissgarten, Assaf Harofe Medical Center, Zriffin; Poland: Prof. M. Majdan, Klinika Chorob Nerek, Lublin, Prof. S. Niemczyk, Oddzial Chorob Wewnetrznych, Gdynska, Prof. W. Sulowicz, Jagiellonian University, Krakow; Singapore: Prof. K.O. Lee, National University Hospital; Sweden: Prof. J. Ahlmen, Lundby Sjukhus, Göteborg; United Kingdom: Prof. M. El Nahas, Northern General Hospital, Sheffield, Dr. S. Mitra, Manchester Royal Infirmary, Manchester, Dr. R.S.C. Rodger, Western Infirmary, Glasgow, Dr. J.S. Tapson, Freeman Hospital, Newcastle upon Tyne, Dr. R. Rustom, Duncan Building, Liverpool, Dr. W. Ayub, Walsgrave Hospital, Coventry, Dr. A. Mikhail, Morrison Hospital, Swansea, and Dr. M. Thomas, Heartlands Hospital, Birmingham. M.L. and J.W. are employees of Novo Nordisk A/S, and M.L. is a stockholder in Novo Nordisk A/S. B.F.-R. and J.S.C. have received consultancy fees and J.S.C. has received unrestricted research grants from Novo Nordisk A/S. The study was supported by Novo Nordisk A/S. The protocol, the protocol amendments, the consent form, and the patient information sheet were reviewed and/or approved by the regulatory authorities in each of the nine countries where trial sites were located, according to local regulations, as well as by local ethics committees before trial initiation. Each of the authors contributed to the planning and conduct of the study and have read and approved all of the statements in the article. The authors had full access to the data, directed the data analysis, and were responsible for decisions regarding publication. We thank the staff at the participating institutions (see Appendix) and acknowledge Karen Batoosingh, MSc, and Thomas Mondrup, MSc, Novo Nordisk A/S, for assistance in preparing this manuscript.